The most powerful shamans from Sweden, Greenland, Mexico, Kyrgyzstan, Mongolia, South Korea, and Kazakhstan have arrived in the Republic of Tuva in southern Siberia for a new international festival devoted to shamanic culture. Besides participants from abroad, the Call of 13 Shamans festival has attracted shamans from four of Russia’s regions – Altai, Khakassia, Tuva, and Yakutia – who are also participating in the event. Drum rites, rituals, meditation, mysteries, and throat singing are all part of the program. The organizers also promise to hold interesting seminars and master classes on the spiritual practices of shamans and divination. All those interested will also be taught the “Eagle” dance, which is part of the Un-Hun spiritual health program. The global goal of the festival is the revival of the shamanic traditions. 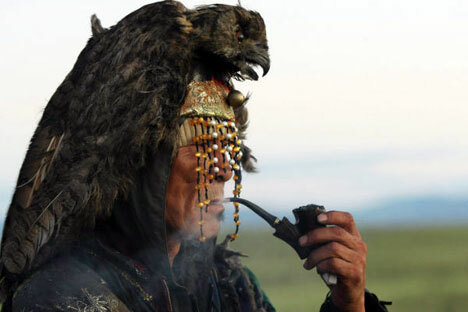 The originator of the idea and the chief organizer of the Call of 13 Shamans festival is the khoomei throat singing master Nikolay Oorzhak, a hereditary Tuvan shaman from the Black Heaven clan. The festival is taking place for the first time and so far without any sponsor support. Nevertheless, the organizers have succeeded in finding an especially “charged” site for the event – the strongest masters have gathered at the Shyk-Bazhy tourist base in the Dzun-Khemchiksky district of Tuva. The Call of 13 Shamans will draw to a close on 27 July, explained Oorzhak. The honorary guest of the festival, the Mexican shaman Don Rogelio Carrillo, said that it was the similarity in the traditions of his people and those of Tuvans that drew him to the distant Siberian region. “The Shamanic tradition that I practice is also very ancient. How old is it? It might be 2000 years old. We haven’t got written evidence about it, but I know for sure that my ancestors did the exact same,” said Don Rogelio.